This is your chance to shape the future of music education. 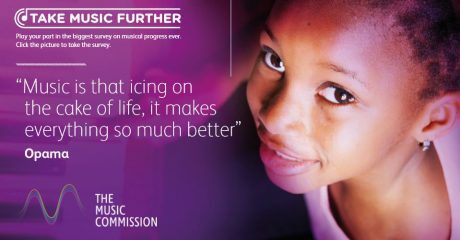 The Music Commission is a national initiative led by ABRSM, looking at the factors behind making progress in music and the opportunities and barriers that people encounter on their musical journeys. The findings will go towards a report in November 2018 that will set out a series of recommendations for policy makers and others. Please help us to Take Music Further and ensure the music education has a sustainable future. We are keen to hear from specific groups across the music sector about the experience and opinions of their community, be it of teachers, leaders, parents or learners. As part of our research, we would like to invite organisations to help us by hosting focus groups with people they feel have something to say about making and supporting progress in music. The aim of the focus groups is to discuss the Commission’s questions and put together a ‘collaborative statement’ for submission, drawing on the thoughts, feelings and opinions of the group. This can be submitted in writing, or using recordings, video content or images. The evidence from the focus groups will feed directly into the Commission’s recommendations and we will name individuals and/or the groups in the final report (if they so wish!) We’ve put together a toolkit for running the focus groups. This includes the questions we would like answered, how to submit your collaborative statement and permission forms for your participants. All statements to be submitted before Friday 8th June.